Wooohooo! What a week this was. Well, for me, it’s been extremely positive. First part was that my dad is doing fantastic progress of healing. The second part is that I got myself a retail official unit OUYA. Third, I got to play around with it. This week mental occupation got me away from all the nonsense that’s been going on in the news. Everything really has been getting sweeter. The Ouya, for me, has that new sense of feeling. It’s like a cross between my feelings when I got a Wii and empowerment from being able to express my feelings deeply with such device. 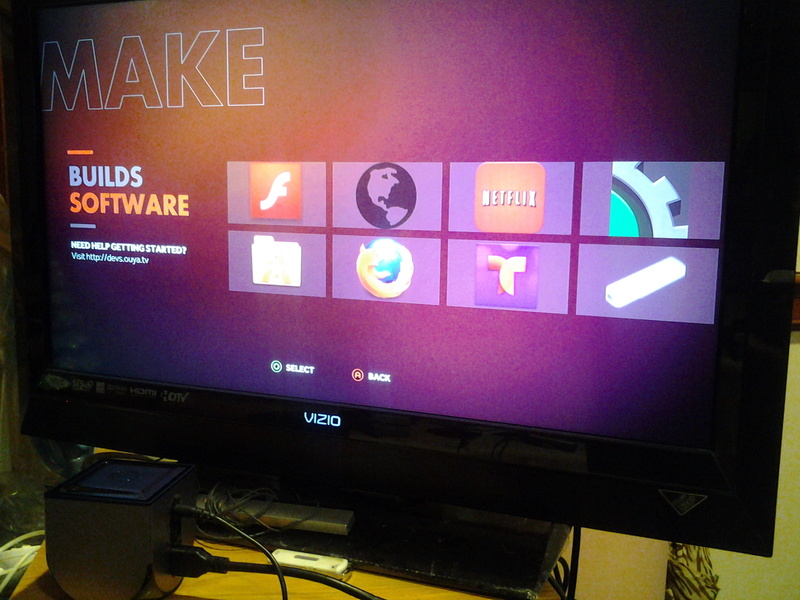 I’m not saying though that I could simply have my PC to do it, but there is always this magic feeling where you get to project your stuff on a TV for some reason. It’s like getting selected to be on Price is Right. it’s just that surreal for me. On the first video I just give a simple initial impression of Ouya, plus other stuff. So after all of that, I stayed over my Father’s room at the rehab center. From there I was making more investigation on the off time chance I had. I tried to upload data through the microUSB wire, but nothing really happen. So instead I followed up on a few youtube videos myself to learn and found a nifty app that lets me install apk from any folder in the Ouya. Thus I got a few new cool stuff inside now, including an old game project in where it actually worked! That game experiment got me to feel how the touchpad on the Ouya feels like in action. I currently don’t favor it at ALL. It’s very clunky experience to have it used in fast action game like my Project Mobile X was (made in Gamemaker:Studio). The design of the project was for touch screens specifically, and in a faster mode of play too. Ouya can’t keep up with the original intent of the game. So if I was to redo it for Ouya, then I would really need to change a lot of things on it. But I feel it would serve to be a good change of pace with my other larger project – to take a break from. Maybe I’ll give it a go. It’s not that ambitious either, so I can manage. But damn, see, that makes 3 projects. I started on the platform goddess sub-project in april that would connect with the main game of DarkZeta Vol 1 as a bonus. It’s taking me longer because of the physics engine that is close to a Mario clone than something else. I do feel though that Ouya needs a Mario clone, so my goddess sub-project works nicely, to become in the future, as a stand-alone game. Initially I want it to be just a 2 level thing with humor and a gender twist. I might provoke some head turns and dig up some hot topics with it though. Anyways, stay tune for more Ouya game developments straight from my indecisive self. This entry was posted in Blogroll, DarkZeta, Game Maker, Learning Stuff, Life, Video Games and tagged game developments, Gerardo Valerio, goddess, King, Ouya, Super Mario. Bookmark the permalink.